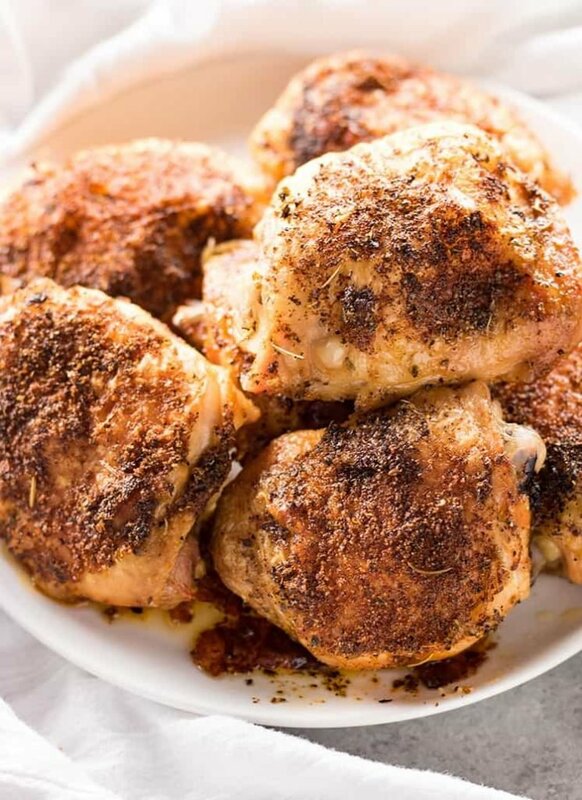 loved this – mixed it up a little; used Hungarian smoked paprika, dried parsley, a drizzle of honey, no onion salt but mixed all dry ingredients – added olive oil and dredged skinless but boned chicken thighs. 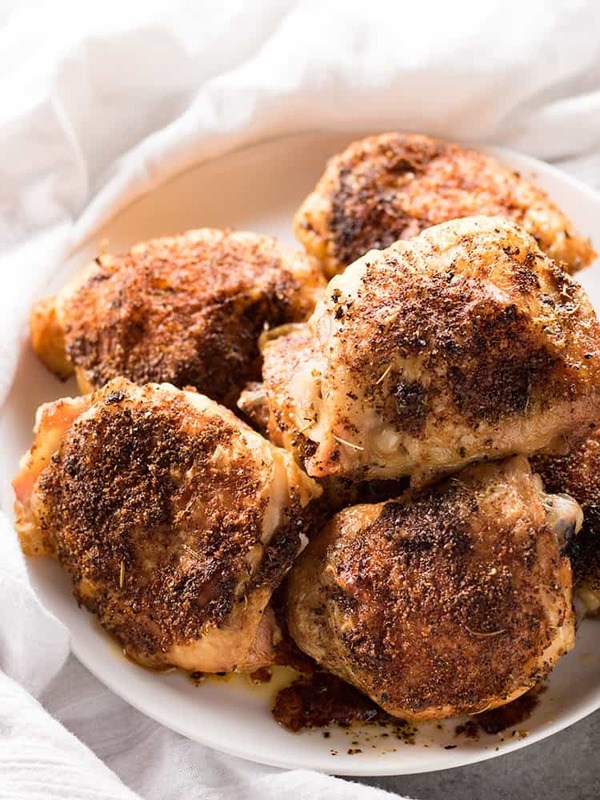 Set in shallow roasting pan and sprinkled a light dusting of seasoned bread crumbs – rubbed it all in and roasted for 40 min. Absolutely delicious – a keeper recipe. Easy and good! Delicious and so easy to make! Followed recipe exactly and it came out perfect! 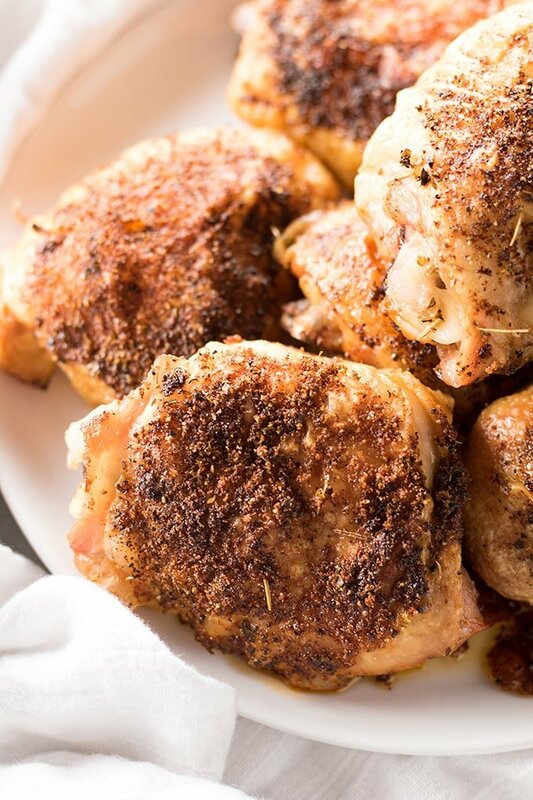 Crispy skin, flavorful, chicken juicy! My family loves it, we make this almost every week! Thanks for sharing this awesome recipe!! I made this for my teenager and I tonight. YUMMY!!! It was a hit. My son said “Oh man, this is good mom”. The only things I did different were, I used boneless and skinless chicken thighs because that’s all I had, I used vegetable oil and coated one side and seasoned, then did the same on the other side. I can’t use olive oil. I also used foil in my pan for the fast clean up. Excellent, fast, and will definitely make this again. Thank you for this recipe!! This recipe is a keeper! Literally just finished eating this and it’s spectacular and easy. Followed the recipe, but used boneless skinless thighs that I had on hand. This was delicious. We actually took chicken thighs out of the freezer to fry, let them defrost, and then followed the recipe exactly. I would however cut the salt in half. This is now going to be added to our weekly menu. Thanks for posting this. I didn’t have italian seasoning and used herbs de provence. It was still delicious. Thanks for posting. I’ll be using this recipe again. I was worried it wouldn’t turn out crispy, as I’ve had trouble getting things crispy before, so I made it along with another batch that used panko. This was leagues ahead – crispy on the outside, moist and juicy on the inside. I will definitely use again. Replying to Frank Loveccio: Panko are Japanese style breadcrumbs. You can buy them in most grocery stores, they usually come in a box. Found in the aisle with the breadcrumbs or sometimes in the Asian food aisle. They’re really good; very crispy and a little lighter in texture than regular breadcrumbs. Cheers! They are Japanese bread crumbs. I made this for dinner tonight using four boneless, skinless chicken thighs, adjusting spices according. (I always cut back on salt.) Anyway, I served it with cauliflower risotto, and it was so delicious. This was so amazing. I didnt bother to mix the spices and just sprinkled them evenly. Definitely recommend broiling at the end just to make the skin perfect. Baking these right now on a rack (tip from another reader). Thinking they’ll be awesome in paprikash. We have this once a week! My family loves it! I followed the recipe to a tee! (I also watched the video) Delicious! Absolutely delicious! Thank you so much for sharing this fabulous recipe. Came out great. I followed the recipe exactly. I cooked on a rack so the bottom would get crispy also. Used a Thermoworks leave in Chefalarm thermometer set to 165°. Came out perfect and juicy after a 15 minute rest time. Very good. Only problem, which was my fault, was that I used all the seaoning for 4 thighs instead of 3 pounds. I coated both sides, as well. Way too salty! That said, very good recipie. Made with both skin on thighs and drumsticks. The drumsticks didn’t crisp up as much so I put them under the broiler for a few minutes. The recipe is excellent! I would recommend only doing half of the salt (1 teaspoon). It’s pretty salty, but I don’t mind! I made this exactly as the recipe instructed, and agree with previous posters that it was way too salty. Next time, I will use 1/2 a teaspoon of salt, instead of 2 teaspoons. Otherwise, it was good. 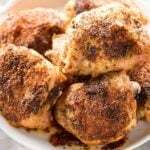 I used skinless, boneless chicken thighs, and baked it for 25 minutes.